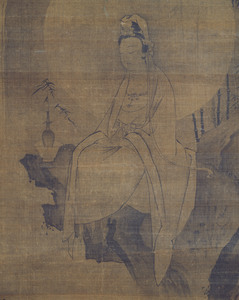 This is a painting of Kannon (Avalokiteśvara) in a white garment sitting on a rock. It can be inferred from the little boy depicted at the lower part of this painting that the motif of this paintings is the scene from the Kegon-kyō (gaṇḍa-vyūha sūtra) where Zenzai-dōji (Sudhana Śreṣṭidāraka) is visiting Kannon at Mt. Fudaraku (Potalaka). The bamboo bush and the waterfall painted in the background are also painted after the descriptions in the sutra. A vase containing a willow branch is placed by the side of Kannon, and a surface of water is depicted below the rock. These objects indicate the iconographical relationship between this painting and two other painting styles, which are the Yōryū-kannon painting (Kannon with a willow branch) and Suigetsu-kannon painting (Kannon by the water under the moon). 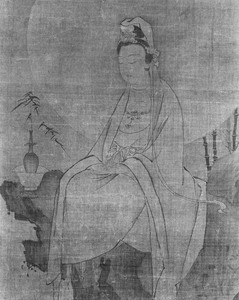 When ink painting became popular, clean and pure impression of white garments attracted the artists, and Kannon in a white garment became a favorite motif especially among Zen Buddhist artists. 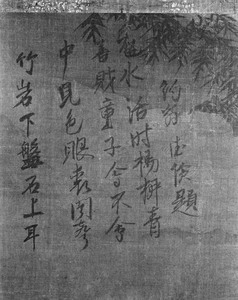 The four-line poem at the top of the painting was written by Priest Yakuō Tokken (1244-1319), who was first living in the temples in Kamakura and then in Nanzen-ji temple in Kyoto. This hanging scroll is one of the most important examples of Japanese ink paintings of the early days. A rather elaborate painting technique was used and spatial depth is well represented. Masterpieces of Nara National Museum. Nara National Museum, 1993, p.38, no.23.